The Parkway Running Club loves to receive feedback about Walter’s Run. Please don’t hesitate to contact us with any comments, suggestions and (most importantly) kudos! 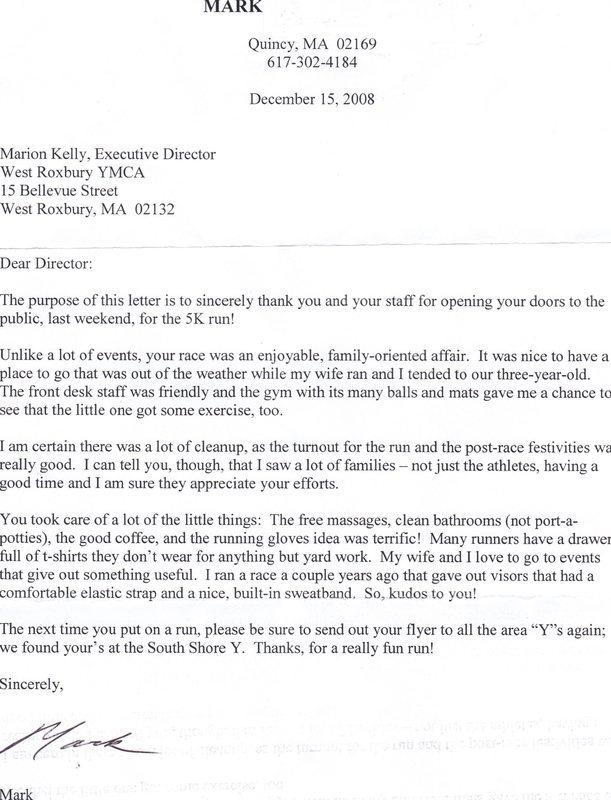 The gentleman who wrote the letter at left loved the amenities and family friendly atmosphere of Walter’s Run. PRC receives many thank you notes from our young “Walter’s Gang“ athletes after their Walter Burgess scholarship at the American Running camp in his memory. Please take a moment to read this beautiful tribute to Walter — Running’s Everyman, A tribute to a runner who made the sport better by Don Allison, December 2003. Hi there, I wanted to congratulate both of you for putting together such a wonderful and successful event. It was such a great environment, motivated runners, people helping one another- I’m glad I was able to participate. Thanks for helping me be part of that experience, I really appreciate it. Anytime you need help, let me know. Thanks again and happy holidays! Dan Cohen, Innovation Fit, 2014 Walter’s Run Lead Pack Sponsor. Here is Karyn’s story. She used Walter’s Run 2010 to get back after a long injury. We will be sure to give her a loud cheer at the race!!! At the end of October (running the Mayor’s Cup), I tore my meniscus in my left knee in two places, fluid leaked into the back of my knee, caused a cyst, etc. Result was surgery at the beginning of November (very discouraging when I was in good shape and psyched about my Boston Marathon 2011 entry). I decided I needed to have a goal, and I figured a semi-realistic one was to be ready to walk/jog a 5k by mid-December (about 6 weeks post surgery). So of course I chose Walter’s Run. Ten days after surgery I got in the pool and started swimming. And a week later I started stationary biking. And the next week was elliptical. Now I’m doing all three (not simultaneously) and this week I’ll try to treadmill SLOWLY to see whether that works. The goal is to cross the finish line at Walter’s Run. If I can do that, I think I can build up to Boston. So thanks for providing a goal. It’s really kept my spirits up during an otherwise really crappy 5 weeks! See you next weekend.